If you have never tried fresh corn tortillas, then you are missing out. They are absolutely delicious. Warm and soft with that distinctly corny-flavour, they are perfect for tacos, tostadas and taquitos. They are also surprisingly easy! See the section below the recipe if you don’t have a tortilla press. Traditional corn tortillas use masa flour, which is corn that has been fully nixtamalize. It is a process that involves soaking and cooking the dried corn in an alkaline solution to break it down. 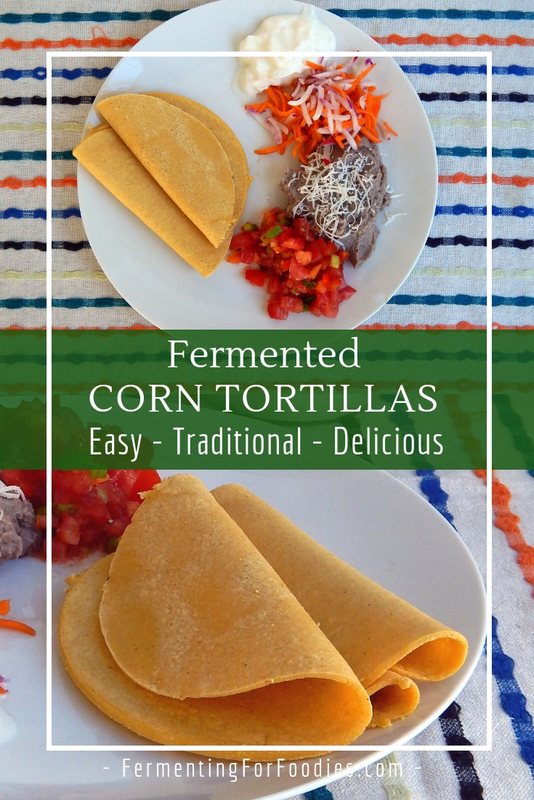 It improves the nutritional content of the corn and is necessary for soft tortillas. However, it is not technically a form of fermentation. Despite the alkaline nature of masa flour, it is still readily fermentable by lacto-bacteria. 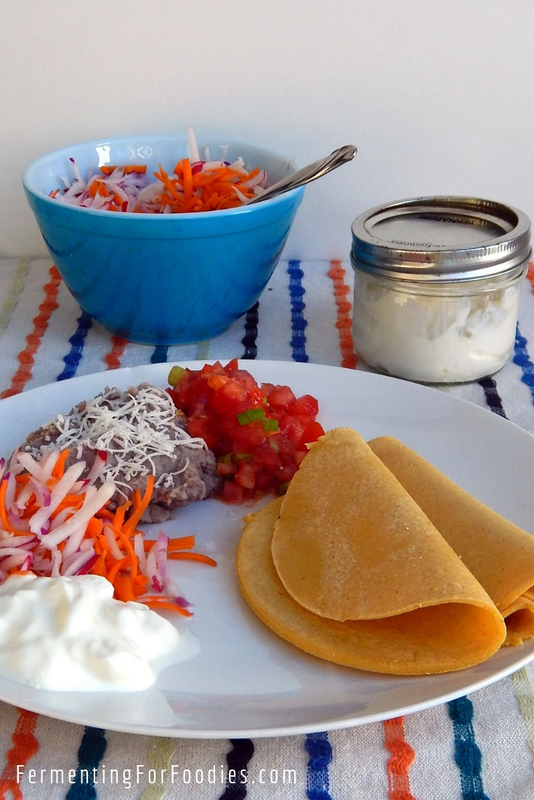 Pre-fermented tortillas have a tang of sourness that nicely compliments a spicy Mexican meal. Pre-fermenting also ensures a nice smooth dough that is easier to work with. Mix the flour, salt and water in a glass bowl. If fermenting, replace 2 tbsp of the water with 2 tbsp of lactic culture. Leave somewhere warm for a minimum of 30 minutes up to 8 hours. Divide the dough into 16 equal pieces, and form into tortillas. See below for different methods of forming a tortilla. Heat a griddle to medium high heat. Working quickly, toast the tortilla for a minute on each side. Wrap freshly cooked tortillas in a tea towel to keep warm and serve immediately. To ferment your masa flour, add 2 tbsp of: yogurt, sauerkraut juice, kombucha or milk kefir. 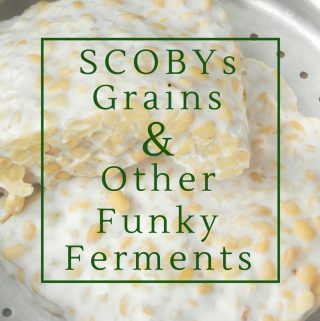 Corn ferments really fast so don’t leave it out for more than 8 hours. Even 2 hours should be enough, as the masa will quickly become sour. would work as well. Either way, you shouldn’t use oil because these are toasted not fried. 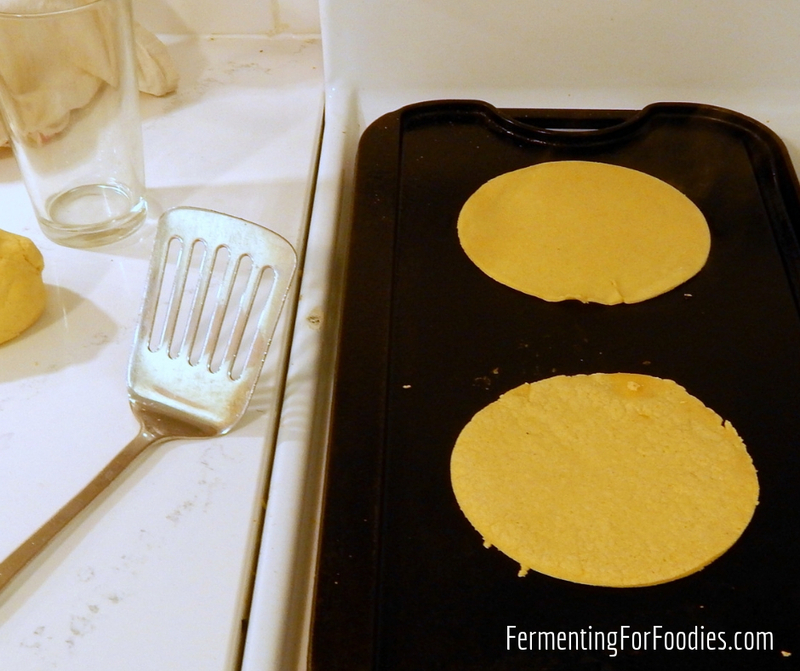 The corn tortillas can be frozen after toasting. Just stack them in a zip-top bag and save for future uses. Reheat from frozen by toasting for 2 minutes on each side. We love curtido and homemade sour cream for delicious and fermented additions to our tacos. is perfect. Just flatten a ball of dough, then use the pot to press it flat.
. The pastry mat makes it easily to peel off the soft tortilla. Usually I’m not fussy, and I leave the tortillas with uneven edges. However, when I’m serving tortillas to guests (or photographing my tortillas), I use a 6″ diameter pot lid to cut out a perfect circle. What a great idea! I will definitely try that the next time. Thanks! Could you use sourdough starter as your fermenting culture? Yes! 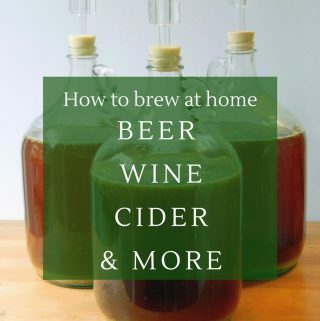 Just start with a really active starter, and maybe give it a bit longer to ferment. Cool! I plan on giving it a shot this weekend! Thanks for the response. Worked out great. I had to knead the dough a bit more than I thought to when I started out in order to incorporate it all together; so accustomed to wheat dough with its different moisture levels. Glad it worked out. It is different from bread dough. Quite firm and dry in comparison.